Samsung Galaxy S8 is the most feature-filled, beautiful smartphone you can get, period. It has the best camera, the best design, the best screen, and the latest specs. I want to give the Galaxy S8 the credit it deserves, so check out all the things the Galaxy S8 can do that the OnePlus 5 can’t. 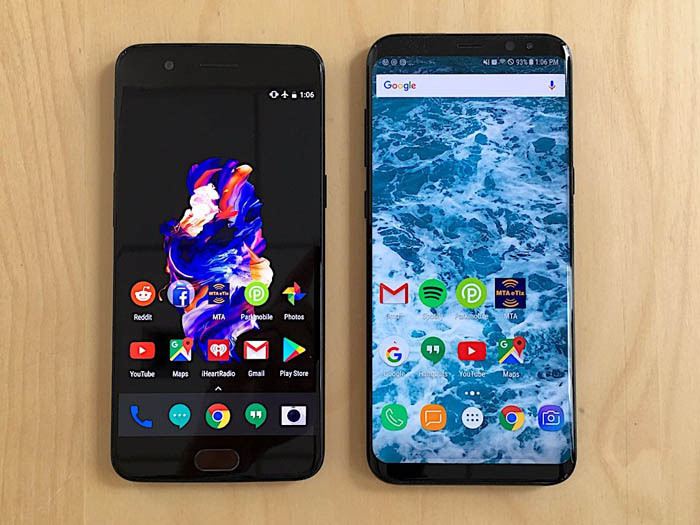 1, The Galaxy S8 has a striking design compared to the OnePlus 5. 2, The Galaxy S8 has a sharper display. 3, The Galaxy S8 is water-resistant; the OnePlus 5 is not. 4, The Galaxy S8 features wireless charging. 5, You can unlock the Galaxy S8 with your eyeballs. 6, You can also use your face to unlock the Galaxy S8. 7, The Galaxy S8 features Samsung Pay, while the OnePlus 5 only has Android Pay. There’s an important difference. 8, The Galaxy S8 is the reigning champion of smartphone cameras.